Someday soon, humanity must make organizing and attending climate conferences a capital crime. These things are worse than useless but they grind on because the folks who like these sorts of things are convention planners. It's what they do. This year's climate extravaganza is being held in Bonn Germany. No one knows why or what they hope to accomplish. An estimated 23,000 people are descending on a tiny little backwater that is obvious ill-equipped to handle them�belching thousands of tons of CO2 on their sacred journeys of self-importance. If anyone suggests that anything important could be accomplished with video-conferencing, the face-to-face crowd reacts in horror. According to them, those who would eliminate these conferences are the worms of humanity�the introverts. Since the only legitimate way to call these conferences a success would be the ability to point at falling CO2 levels, and that clearly has not happened after 23 years of conferencing, a sane person would try something else. But these folks cannot even progress to video conferencing. And since few or none of them seem willing to grapple with the problems of progressing from legislating outcomes to funding outcomes, we can assure ourselves that no meaningful progress will happen anytime soon. Climate change is a Producer Class problem that will only respond to Producer Class solutions. Climate conferences are extreme manifestations of Leisure Class behavior. Pretty much explains why they are useless. After all, useless is the primary goal, the heaven, of the Leisure Class. In 1995, at the first UN climate �conference of the parties' (COP) in Berlin, about 4,000 people gathered in a small venue to begin hashing out the rules of the Kyoto Protocol, which would be agreed two years later. This week, 23,000 people are flooding into the small city of Bonn, Germany for what has become an incredibly complex, expensive and emissions-intensive yearly event. It's costing Germany �117 million ($135.5 million). Bonn has built two tent cities along the river Rhine the size of eight football fields. Participants must take a shuttle bus to travel between them. "It's so confusing!" gasps one delegate as she rushes by with a rolling suitcase. "And nobody can tell me where to go!" Two days in, the city's infrastructure is already under strain � and most people haven't even arrived yet. Bonn's public transport system was overwhelmed on Tuesday, with trams becoming so packed some people were forced to get off. Bonn's 9,000 hotel beds have been booked out for months, motivating many to stay in the nearby - and bigger - city of Cologne. But construction work on the tracks between the two cities has made traveling between them a nightmare. This isn't the first time the former German capital, home to the UN's climate secretariat, has hosted a COP. In 1999, delegates worked together in Bonn to devise the rules of the already-agreed upon Kyoto Protocol. But just 4,188 people came to town for that summit � much more manageable. The fact that so many delegates are attending this conference, in an interim year where no major decisions will be taken, shows just how important these summits have become. It's nowhere near the record 38,000 that came to Paris two years ago, but it is strikingly close to the 27,000 people who came to Copenhagen for the previous attempt to clinch a deal in 2009. Some are concerned about how enormous the climate summits have grown to become, saying they are too polluting and too expensive � requiring too much sponsorship by big corporations. 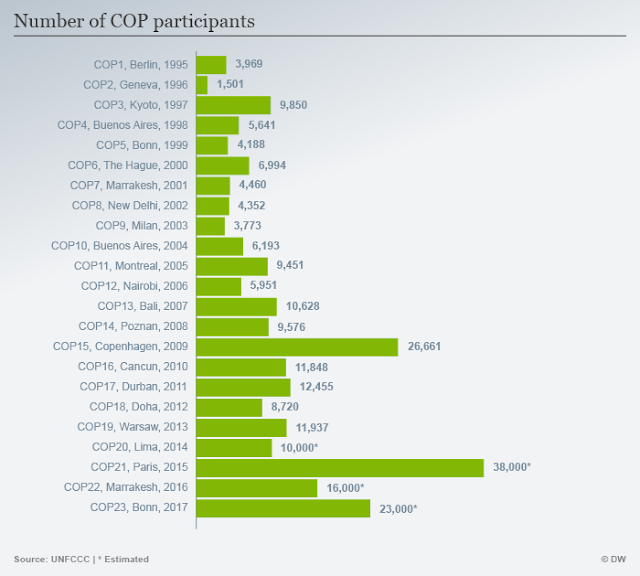 According to the UN, the 2009 Copenhagen summit emitted the equivalent of about 26,000 tons of CO2. But this does not include travel. According to an analysis by Wired Magazine, transportation for the Paris delegates emitted 300,000 tons of CO2. If the emissions can be avoided, wouldn't it be better to do a virtual conference? The hosts are sensitive to these concerns. Germany held a press conference this morning explaining that the summit is "the greenest UN climate conference ever." "The emissions have been really managed down, from the food that is served�right to the emissions that are coming from travelers all around the world coming to Bonn," UN climate spokesperson Nick Nuttall told DW. A consultancy has been hired to calculate how much emissions were produced by the summit, and the result will be published afterwards. Those emissions will then be offset through climate financing from Germany, something undertaken by all hosts in recent years. Still, wouldn't it be better to keep emissions down and not spend all of this money in the first place? Delegates at the summit told DW that although the logistics of attending such a huge summit can be difficult, it's worth it. "Nothing beats face-to-face time," said Hannah McKinnon from the NGO Oil Change International. "This is my tenth COP, and there's something very familiar about them at this point. You come and it's a nice reunion, you see a lot of your colleagues and friends that you really only see once a year." But McKinnon didn't have to come far. She lives 400 kilometers up the Rhine in Freiburg, Germany, just two hours away by train. Her roundtrip journey will produce just 0.04 tons of carbon. For Seydun Kane from Senegal, the journey was much longer and more stressful. He flew from Dakar to Paris, then to Dusseldorf � a journey which will emit two tons of carbon. "We had some problems when we arrived in Dusseldorf, there was no translation, only German, and we cannot speak German," he said, adding that they then had train problems getting from Dusseldorf to Bonn. "We lost a lot of time." He says the set-up of the enormous tent city, with two different locations separated by a shuttle bus, has been inconvenient. "Everything is nice when you're inside the pavilion, but the problem is the transportation between the Bonn Zone and the Bula Zone," he said. "You need to leave the other side to come here, and sometimes you miss important events." The organizers have said the event's massive size necessitates two separate zones for the negotiators and for the NGOs and businesses. But McKinnon says this can create symbolic difficulties, compared to previous smaller COPs where the two sides were closer and interacted more. "With the Bonn and Bula zones being quite a ways apart, what does that mean for the interaction of the different constituencies?" she asked. "Will negotiators ever be over here? Those are questions that are not unique to Bonn." McKinnon is an experienced COP attendee. For 20-year-old Kiran Ooman, a student at Seattle University, this is the first climate summit. His journey will emit 3.3 tons of CO2. He is one of the plaintiffs in a lawsuit against President Trump and the US government for its inaction on climate change. He sees no problem with the fact that the summits have grown to such a huge size. "I think it's a great thing, the more people are talking about this the more people might actually do something," he said. "I have been very impressed, meeting all of these incredible people from all over the world." Savitree Srisuk, a specialist on environmental education from Thailand, says she thinks her German hosts are making an effort to mollify the environmental effects of the summit. A roundtrip flight from Bangkok to Bonn emits four tons of carbon. "I feel like the German organizers are really concerned about the environment, and how people at this event can show their action in protecting the climate," she said. "They're very concerned about the garbage, and how we use products in the pavilion. Anything that we use every day, like water and food, these things have to be eco products." Hans Naome with the campaign group Nuclear for Climate had a much shorter journey. He drove from neighboring Belgium, a trip that will emit 0.17 tons of carbon. He had to take vacation days off work to come for the summit to advocate for the place of nuclear power as part of a zero-emissions energy mix. But he says it's worth it, especially for a cause like his which can encounter skepticism.